Honda has a long-term appreciable tradition of bringing up unique and stylish cars in the global market to captivate the instant noticeable attention of customers. For this time, the surprise is all set for the brand new version of Honda Civic Sedan which has come up with fresh novel varieties of stunningly bold colors for the local customer market in Pakistan. 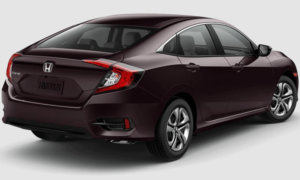 Honda Civic has an extremely popular status among the people of Pakistan and this newly released sedan has tremendously increased immensely valuable demand for all potential buyers. It has recently introduced a new wave of curiosity among customers to make an immediate decision to buy this amazing sedan car. This new trendy Honda Civic provides a dashing appeal to keen buyers in Pakistan built with a sleek shine robust aerodynamics shape design structure with glittering attached accessories comprising of larger front rectangular shaped headlights, DRL LED lights, front metallic grille, round shaped fog lights, side indicator lights, side turn signal power door mirror, front bumper, and alloy wheels. The backside also gives a bold catchy attractive display for customers added with combination taillights, rear bumper, and rear fog lights. The newly added exterior body colors are carnelian red, urban titanium, modern steel metallic, taffeta white, lunar silver metallic, crystal black pearl, brilliant sporty blue metallic, and the finest burgundy night pearl. These colors add up a great value for this urban sedan car to give a lasting solidified impression on customers. The interior side provides a true combination of comfort and luxury arranged with comfortable yet flexible folding down leather seats. The seats provide an ease of legroom space for passengers so they can be seated with good convenience. The rear trunk is built for a widely extensive cargo storage loading accommodation with an easy opening and closing tailgate. Moreover, the front side dashboard offers a fancy style contemporary display and equipped with modern innovative features like smart keyless entry, push engine start system, auto air-conditioner, a multimedia navigation system, and cruise control. The driving safety features are also included as an electronic parking brake, hill start assist, vehicle stability assist, emergency stop signal, G-force control, dual SRS Airbags, anti-lock braking system, and electronic brake-force distribution. This right hand 4-door terrific sedan car is fitted with 1.8 liters of gasoline fuel engine and powered by a CVT automatic speed gear transmission. The grade price packages are Civic I-VTEC and IVTEC Oriel.